Sometimes a quilter just needs to take a break from quilting. A break from planning, cutting, and stitching. We need to get away from the sewing room, for just a bit. Completely away, no quilt meetings, no quilt magazines. What do we do when we need that break? Now there are several authors who write books with quilts in them. They are good books, in fact I will be reviewing some of them later this summer. 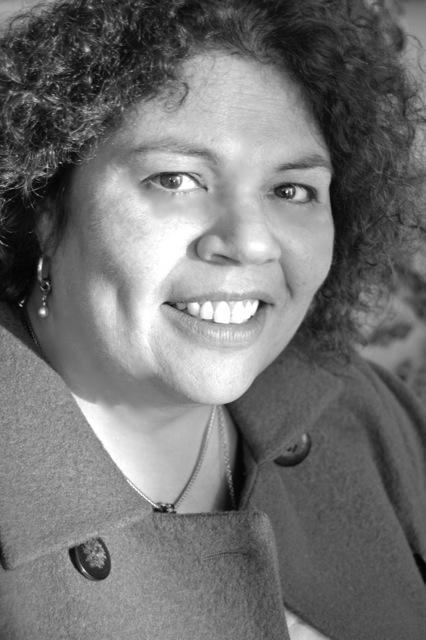 However, for something completely different, a book that is pure enjoyment, allow me to introduce Mariam Kobras, former quilt artist turned word artist. Unfortunately, that doesn’t make for much of a blog post, or tell you anything about the book. Naomi Carlsson is a “poor little rich girl” in one sense, but she is so much more. Her parents own the world-famous Carlsson Hotels and she is expected to take over the running of them. Yeah, right. Remember when you were eighteen? Did you have dreams? Did they coincide with what your parents, or society thought you should do? What did you do? 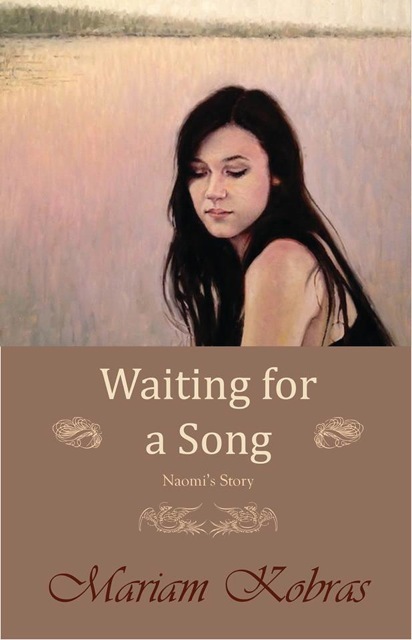 WAITING FOR A SONG is Naomi’s story of growth, and independence. Everyone expected her to become engaged today. After all, it is her eighteenth birthday and her soon-to-be fiance has been waiting years for her to be old enough. Except, she’s not sure she wants to marry him, and there is not a crown prince available for her. Which is a good thing, since she doesn’t want to marry a prince either. Naomi isn’t the demure little thing her parents and future husband, Seth want to make her into. When Seth, knowing she loves to ride, gives her the gift of a horse, a pedigree Arabian, it reinforces Naomi’s idea that he isn’t the man for her. Especially since her favorite mount is a stallion Apollo. She thinks the Arabian looks like a puppy and has no interest in it. Shouldn’t the man she marries know her and understand her love of Apollo, and how she would view the difference between the two horses? The horse issue is one more piece of evidence that those who profess to love her don’t know her and only view her as possession, something valuable and needing to be safe guarded at all costs. She feels as though she’s bound with golden shackles, and smothered in loving protection Naomi is her own person and knows her own mind. From riding Apollo and feeling the wind in her hair to following her dream of song writing Naomi begins to find her way out of the maze of concern and protection her parents have hidden her in. WAITNG FOR A SONG, is Naomi’s story. It’s more than a romance, it’s more than a coming of life story. It is a story we are all know and have experienced to some degree. It is also a bit of a fantasy, imagine running away from home in style, aboard a jet plane and having the opportunity to see some of your fantasies come true. Would you take that chance? Would you leave behind all that is familiar to you for the adventure of the unknown? 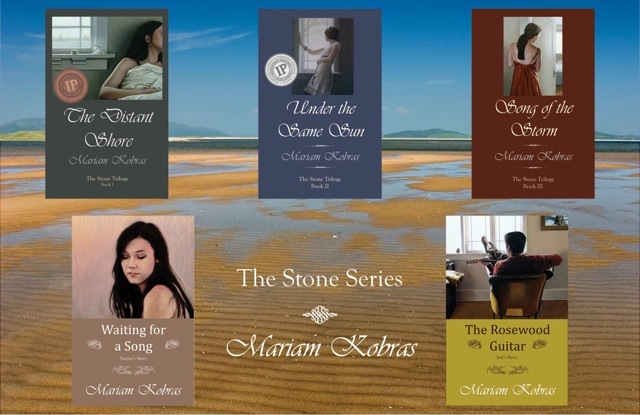 Unlike most books that are part of a series, WAITING FOR A SONG, which is Mariam’s fourth book (I think, I’ve lost track,) stands on its own and does not need the previous books to be understood, or enjoyed. Although, if you haven’t read the earlier books, now you will want to. For a change of pace, take a break from quilting and read the entertaining works of quilt artist turned word artist, Mariam Kobras. 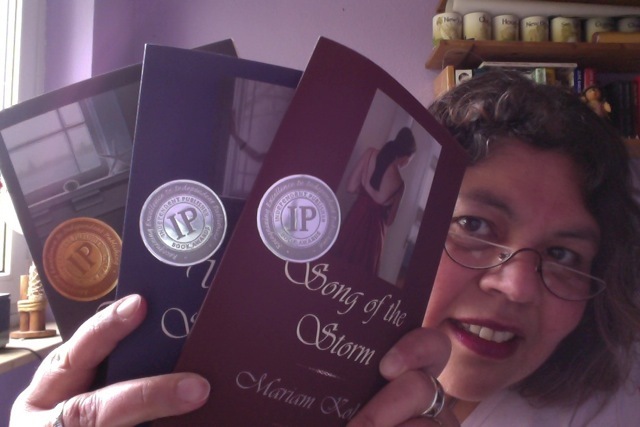 This entry was posted in book review, writing and tagged authors, bloggers, book review, family, friends, Home, Mariam Kobras, people, quilt artist, quilter, reading, writers, writing on June 19, 2014 by Nita. 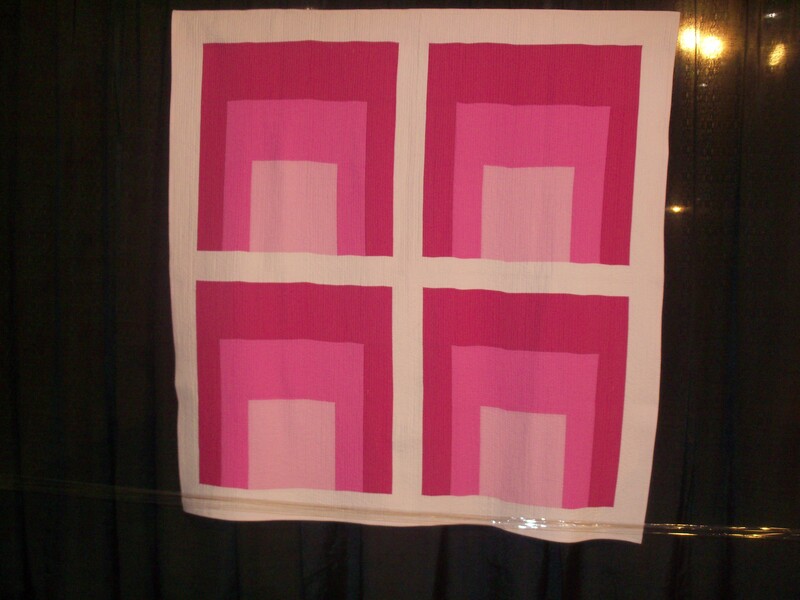 is for the International Quilt Show in Houston Texas. The show runs for a week, and every day is needed. There is so much to see and absorb. Pictures and memories from the 2012 show have had to sustain me, as I missed last year’s show. This year though, I plan to attend. 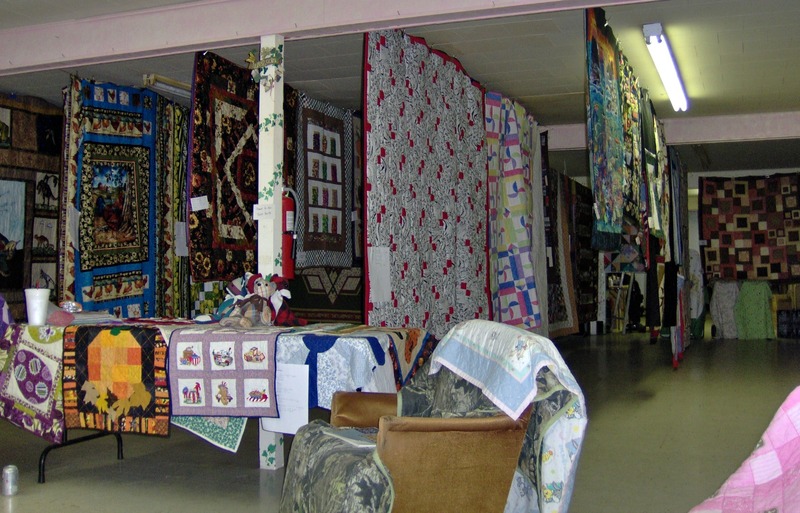 The show has everything; international quilts, like the winning quilt shown above, unusual displays, vendors, and more quilt. Since the show is held the first of November, sometimes it runs into October and Halloween. 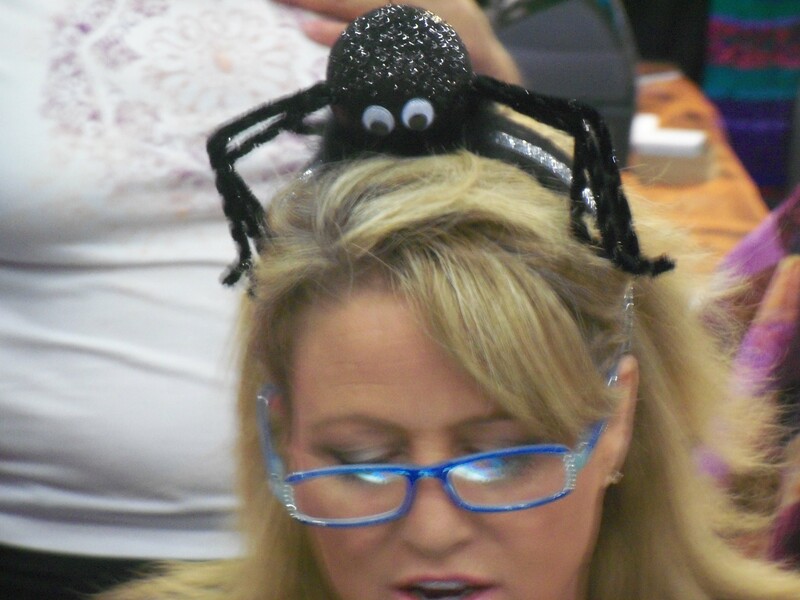 That happened in 2012 and some of the vendors, to add a little more fun to the event wore “Halloween things.” Like this vendor with the spider on her head. I’m guessing they have fun and unusual displays every year. They certainly did in 2012. Ever seen a quilted Yurt? Goodness, I’d never even seen a Yurt except on television. 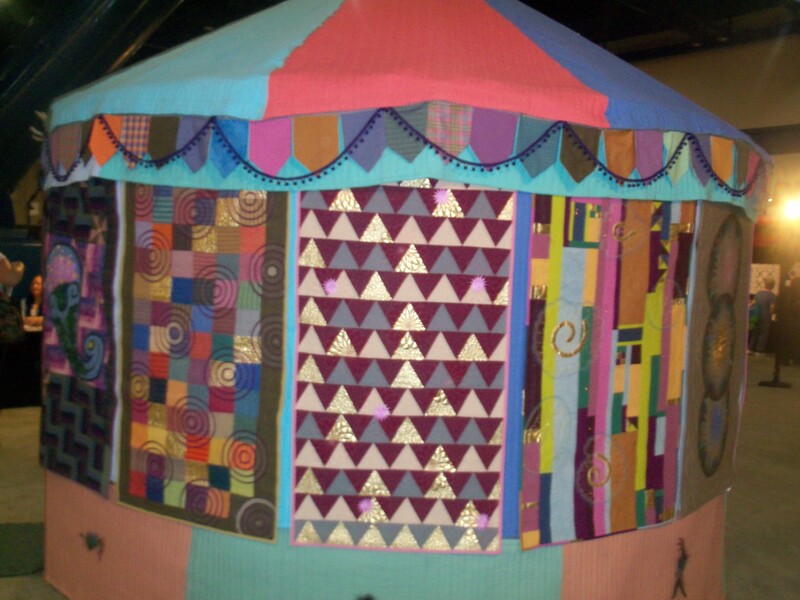 The Quilted Yurt was the brain child, and work of Linzi Upton. If I didn’t live in windy Oklahoma I’d consider constructing one for myself. 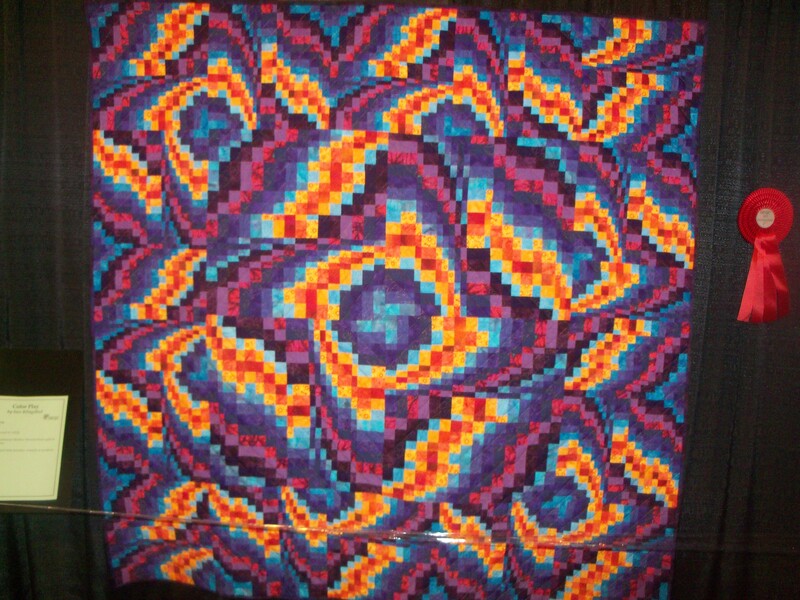 Amid all the quilts is the opportunity to see live and in person a quilt mentioned, or shown on Facebook, or in a blog. Like this quilt, Anni in the Modern Quilt Showcase by Heather Jones, a quilter and blogger I follow. In addition to seeing all the cool quilts, learning about new tools, and meeting new people is the opportunity to actually participate in the show. In 2012 they had a mug rug exchange. Quilters brought a mug rug to contribute, and took a mug rug home. Very fun to see even if I didn’t have a rug to exchange. Aren’t they pretty. I especially like the egg shaped ones. The International Quilt Show in Houston is definitely on my list of quilty places to visit. 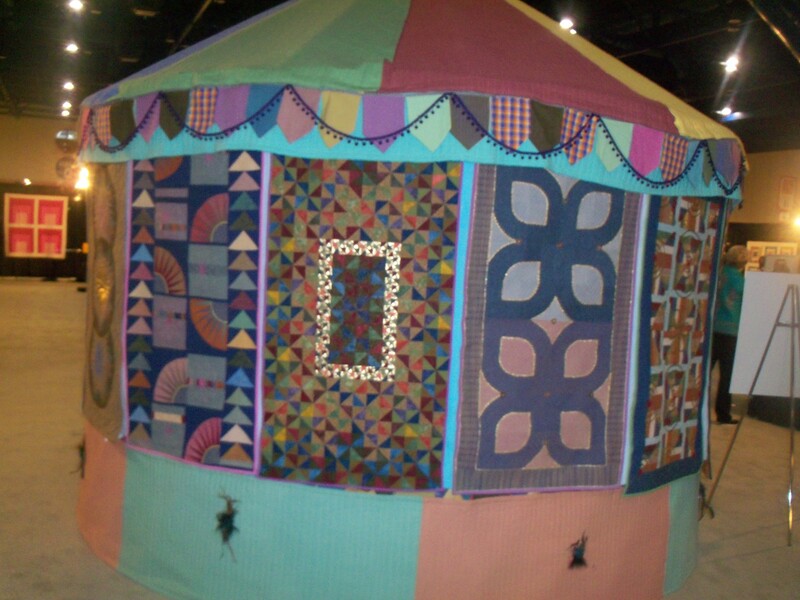 Have you ever been to the Houston Quilt show? What would you enjoy most about going to the International Quilt Show? What would scare you the most about going? This month I am participating in the A to Z challenge. I hope you’ll visit some of the other bloggers following the alphabet with their posts. This entry was posted in A to Z and tagged bloggers, devoted to quilting, friends, Houston Texas, International Quilt Show, Linzi Upton, nature, outdoors, people, photos, pictures, quilt show, quilter, quilters, travel on April 10, 2014 by Nita. “There’s nothing to having a quilt show. We just hang some quilts and people come look at them. ” Ever heard those words, or similar words when considering sponsoring a quilt, or craft show, or a book fair? If you have, you can gently inform the speaker there are at least 5 items you must consider to help ensure you have have a good event. 1. Location, there must be some place to display all your beautiful work. A location that can be secured if the show is more than one day, and one that will protect the quilts from the whims of mother nature. Finding a location for the quilt show is paramount. 2. Date and Time. When will you have the show? A date and time that works best can take a lot of discussion and consideration. In Oklahoma, we don’t schedule a quilt show on the same weekend as the OU/Texas or OU/OSU football games. Attendance will be low. Figure out the dates that will work best for your group. After you have a date, you’ll need to have the open and closing times for your show. How early will you open and how late will you stay? These vary from show to show and area. 3. 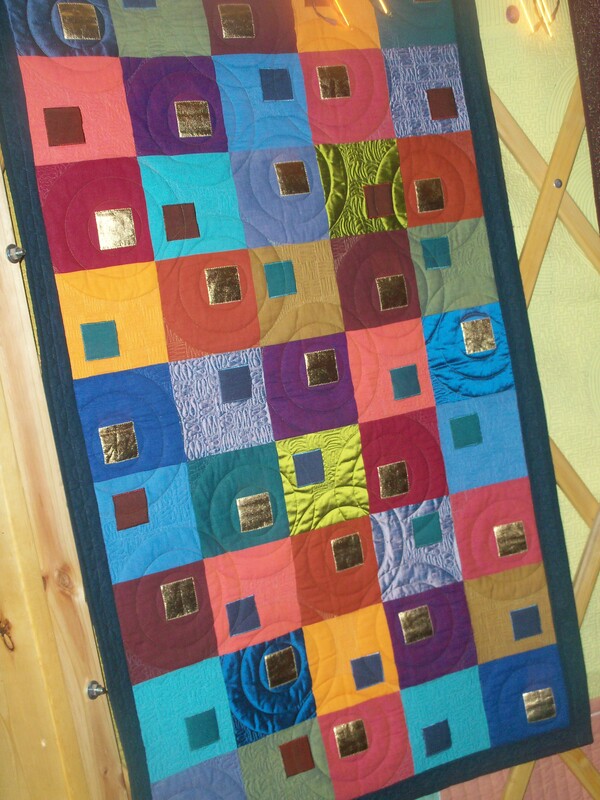 Display Method – How will you display your different sized, and types of quilt and quilty items? Poll your members, someone will have the perfect idea of a display method that works best for your group. 4. Workers – Ah yes, the backbone of any group endeavor, people to actually do the work. Luckily most groups have enough members that the workload can be shared with no one having to hang the quilts, work the guest book, monitor the guests (no touching the quilts), do the advertising, design the programs, and any other jobs necessary. More people participating makes for a better show for everyone, guests and hosts. 5. Advertising – No one will see all your hard work and beautiful projects if they don’t know about them. Advertising will draw new people to your show, and introduce them to your group. It is vital for even the smallest show. Our quilt group, The Material Girlz, had our first annual show in June. We had 103 items on display. Too many for our small space, but we were so excited to have a full show and not a half-empty room with too-few quilts. We learned much about putting on a show, and over the next five Mondays, I’ll explore a little more in-depth each of the five major components of having a successful show. 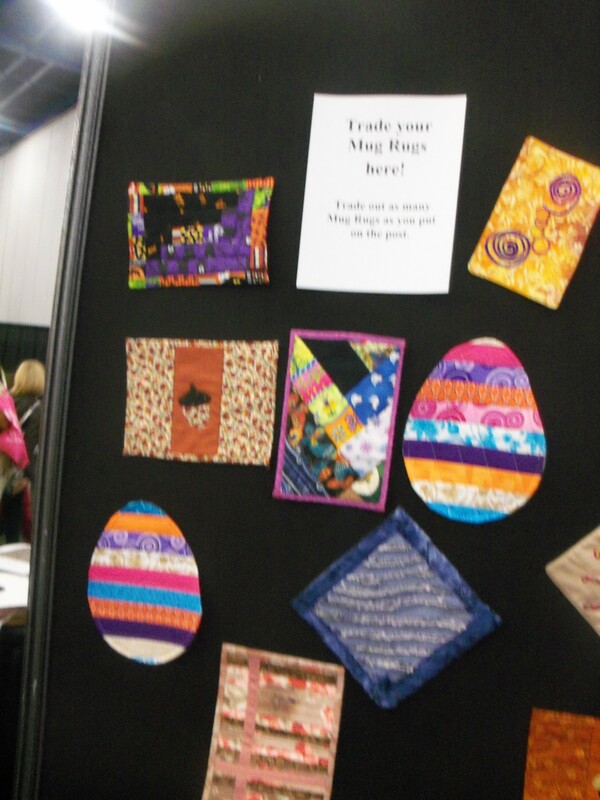 Has your quilt group ever sponsored a show? Share your favorite tips in the comments. This entry was posted in Devoted to Quilting, Monday Marketing, Quilt Show and tagged Blog, bloggers, devoted to quilting, diy, friends, quilt, quilt show, quilter, quilters, quilting on July 1, 2013 by Nita.